Opinion | What Happens When North Korea Talks Fail? 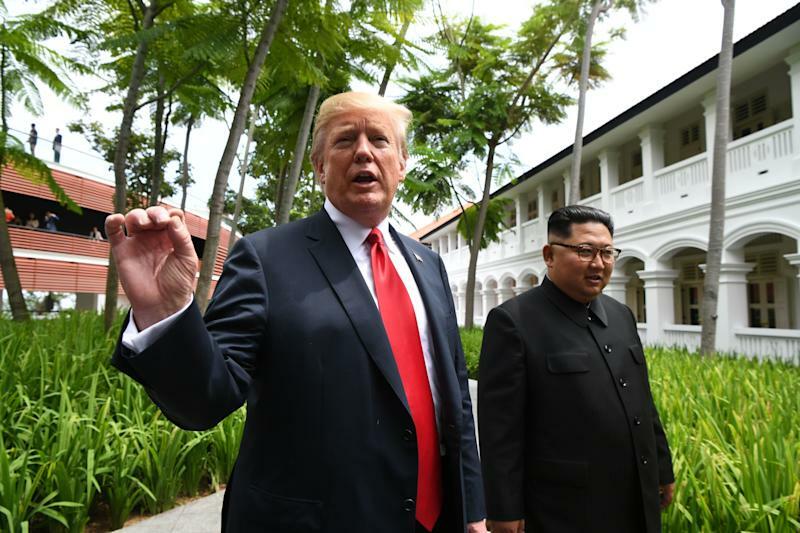 President Donald Trump speaks to the media as he walks with North Korean leader Kim Jong Un during a break in talks at their summit in Singapore. Let’s not be too critical of President Donald Trump. As long as he and North Korean leader Kim Jong Un are swapping pleasantries rather than threats, the United States and North Korea are unlikely to start exchanging nuclear weapons. And, it’s not impossible that the Singapore summit will spark a process that succeeds, over the long term, in curbing the threat from North Korea. Unfortunately, however, that outcome is also pretty unlikely right now. The summit — and particularly its aftermath — was a farce. And, while it doesn’t need to be this way, the president’s bombastic all-or-nothing approach to denuclearizing North Korea means that, by the end of this process, we could easily be closer to a war than when we began. We’ll start from the end — the news conference that Trump gave immediately after the summit. Let’s ignore hisdescription ofthe North Koreans being tortured in gulags as “the great winners,” as well as hispromotionof North Korea real estate opportunities, and focus solely on how he fared in trying to convince North Korea to abandon its nuclear weapons. Trump indicated that North Korea had agreed to disarmunilaterally and verifiablyand that it would start “right away.” He may honestly believe this description, but it’s a serious misrepresentation of the summit’s outcome. What came out of the summit was a brief, vaguestatementin which North Korea recommitted itself to “work toward the complete denuclearization of the Korean peninsula.” The term “complete denuclearization of the Korean Peninsula” isn’t new. North Korea first agreed to it (albeit without the word “complete”) in1992and has repeated it onvarious occasionssince then. It has, however, never beendefinedprecisely — and the summit provided no additional clarity. But, for Pyongyang, it requires unspecified but presumably significant concessions from the United States and South Korea: the end of their alliance, perhaps, or the removal of U.S. troops from the peninsula. In fact, some past joint statements with North Korea were significantly stronger than this one. In particular, in2005, North Korea “committed to abandoning all nuclear weapons and existing nuclear programs.” Given that Kim did not reiterate this commitment in Singapore, it strongly suggests that he no longer intends to abide by it. In short, whatever it was that was agreed to in Singapore, it’s not the “complete, verifiable, irreversible denuclearization” the Trump administration has sought. In a news conference immediately following their meeting, Trump said Kim had agreed to start the process of nuclear disarmament "right away." To be fair, the Singapore summit is only intended to start a process. Secretary of State Mike Pompeo is now supposed to go off and work out an implementation plan with, worryingly, an unspecified North Korean counterpart. Yet, such a process would have a much greater chance of success if it were built on solid foundations. For example, theinterim agreementthat the P5+1 reached with Iran in 2013 ― the deal before the deal ― was much more detailed than the Trump-Kim joint statement and represented genuine agreement on basic principles, thus paving the way for the 2015 Iran nuclear deal. It’s very difficult to see the Trump administration reaching anything remotely comparable with North Korea. Diplomacy is nonetheless likely to continue for the time being. However, sooner or later — most likely within the next year or so — it will become clear that Kim is not in the process of “de-nuking the whole place,” as Trump hopes. At this point, the risks of a war will probably start rising again. 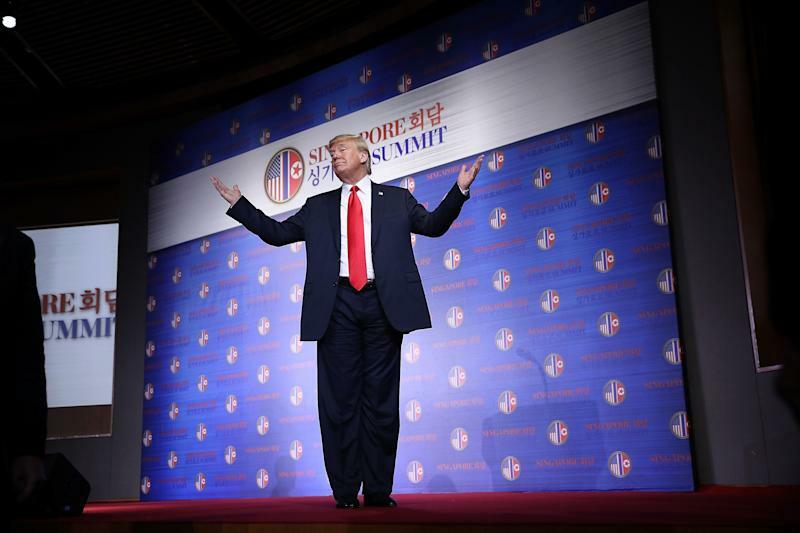 At the news conference in Singapore, Trump unveiled (much to thesurpriseof South Korea) a big and apparently unilateral concession: the suspension of U.S.-South Korean military exercises. Restarting these exercises when North Korea fails to disarm will lead to a serious increase in tensions — more so, in fact, than if they had never been suspended. Moreover, once diplomacy has been tried and it has “failed,” what else is left? 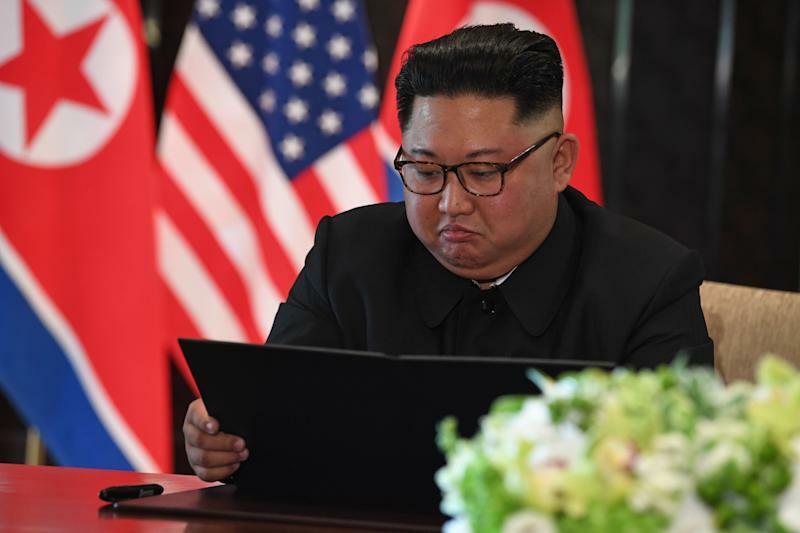 Kim looks at his document at a signing ceremony with Trump. The brief, vague joint statement included a clause stating "the DPRK commits to work toward complete denuclearization of the Korean Peninsula." North Korea, for example, has already announced a moratorium on nuclear tests and intercontinental ballistic missile flight tests. The United States should now press North Korea to expand this moratorium to include missiles of shorter ranges than ICBMs and also ground tests of missile engines. It should also aim to have North Korea sign and ratify the Comprehensive Nuclear-Test-Ban Treaty, which would make its moratorium on nuclear tests legally binding. Another goal should be for North Korea to agree not to operate any nuclear reactors, which could be used to produce more plutonium and tritium (a material that is useful for miniaturizing nuclear warheads). North Korea’s reward for taking such steps should primarily be economic, though the United States should also consider further ratcheting down its military posture. For example, Washington could commit to not conducting bomber training missions within a certain distance of North Korea’s borders (such operations are presumably not covered by the suspension of joint military exercises with South Korea). These modest steps would hardly be a panacea, but they would go a long way to preventing the threat from North Korea’s nuclear and missile programs from getting worse. If implemented successfully, they could pave the way for more challenging measures, such as a cap on North Korea’s enrichment of uranium. This step-by-step approach is not the yuuuge win Trump is looking for — but it’s a better option than betting everything on immediate and complete denuclearization with the risk of a war if we lose. James M. Acton holds the Jessica T. Matthews Chair and is co-director of the Nuclear Policy Program at the Carnegie Endowment for International Peace.